Most of the traditionalists despise rat rods, but for young kids – and even older guys on a budget, building a rat rod is an easy way to get into the hobby. Isn’t that what we all want to do; spread the love of rods to everyone? Our obligation as a hot rod/street rod magazine is to cover as much of the hobby as we possibly can. One of those growing areas of the sport is the Rat Rod community, which has become too large to ignore. When the opportunity to work with Tommy Ring and RingRods presented itself, we jumped at the chance to cover Tommy’s latest build. While rat rods may not be everyone’s cup of tea, there are many would-be builders that will seize the moment and decide to build a hot rod for under 1,500 bucks. Tommy Ring and Ring Rods have years of experience using some of the most economical material to build basic rat rods that even those on the tightest budget can afford. Now he is here to help others by explaining the most economical way to go from junk, to driver, without having to skip a meal to pay for the parts. Using a blend of what you have with what you must have to build an inexpensive rod is what the rat rod builders are all about. As we see it, this is an important step for our hobby. Young guys that would not normally have the resources to build a high end hot rod, can get starting in the sport by building one of these rats and have something to show for their effort. They may someday sell their rat rod and attempt another build, eventually ratcheting their way up to a car show winning hot rod in the end. Others may decide that rat rods are an art form and continue building these bare bones rods, showing others how to do the same. Either way, our hobby – and the industry – comes out ahead. That is why we opted to join forces with Tommy Ring for his newest build. Tommy came by automotive maintenance the right way, his father wrenched and welded on cars all of his life. He passed on the love of automobiles to his son, while teaching the young man how to work with his hands. Taking a side-step for a career in the music industry, Tommy earned a living as a road musician in various venues across America. He also worked as a studio musician and wrote for a jingle company, yet always had a project hot rod on the side. In 2009, Tommy opened Ring Rods Hot Rod Shop, and in 2012, began writing for a Rat Rod Magazine. 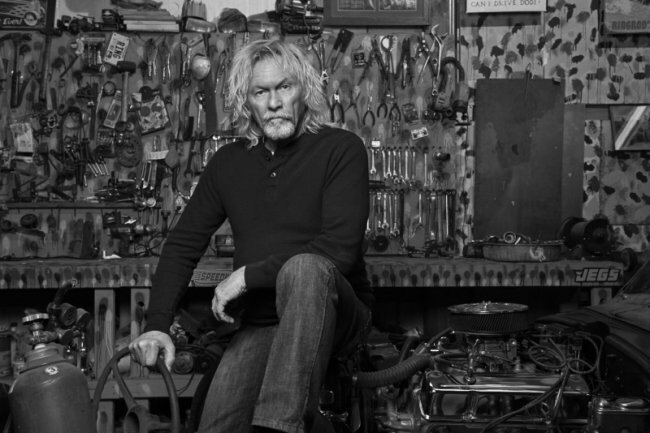 Featured on TV, radio, podcasts, and several magazines, Tommy has also has a successful rod building video sold worldwide. No one can describe Tommy’s work exactly the way that he can, so we decided to let him introduce the build in his own words. The step-by-step build articles in the future will also be written by Tommy in their entirety. 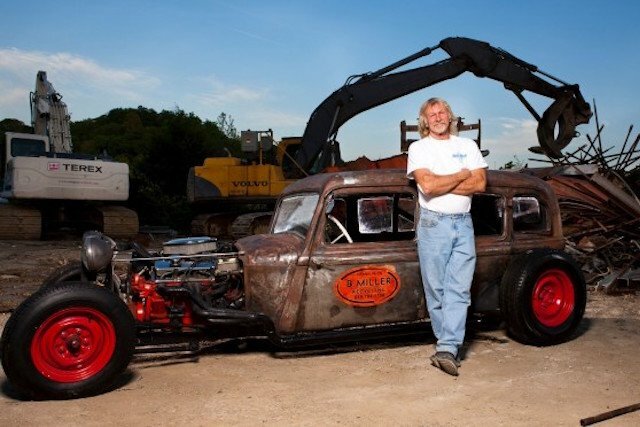 Tommy Ring: For the three people who don’t know what a rat rod is, a simple introduction would be an extreme, low-dollar hot rod, built from bits and pieces of any make or model, pre-1963. This genre all began when a bunch of young, penniless bucks dreamed of owning a hot rod and decided to forego the opinions of the old geezers dictating what a hot rod was. Some would argue that rat rod owners get more enjoyment out of their rods than the guys that build the high end rods that never get driven. The aforementioned pre-’63 parts didn’t have to be in any certain order by the way. They could be a ’36 Dodge body with a ’49 Ford dash and a Chevy motor coupled to an Olds rearend. Paint and interiors, as well as custom wheels, are also eliminated. To make it even more perplexing is the fact that the more rust, the better. If rust is covered with clear coat, viola, you have a rat rod. The more the old traditional rodders denied rats being true hot rods, the more young bucks showed up at car shows with their $1,500 rides, getting their fair share of attention – if not all of it. While the old guy’s butts were working button holes in their custom lawn chairs, the young bucks were totally laid back because it didn’t matter how many car doors were slammed into their rods, or how many kids were allowed by clueless parents to climb all over their cars. Understanding how to build a rat rod that is safe and roadworthy is an important part of the hobby. I digress, but not much … I happen to be one of the old geezers previously mentioned, writing for a rat rod magazine for the last five years, and listening to hundreds of opinions via email, Facebook and phone calls, and even occassionally, snail mail. Funny thing is, a lot of us old timers are climbing on board because who wouldn’t want a $1,500 rod, if only for parts runs and grocery shopping alone? No worries about rain, wrecks, wild buck kids, and no Saturday afternoons polishing and waxing. Sounds like Heaven to me. 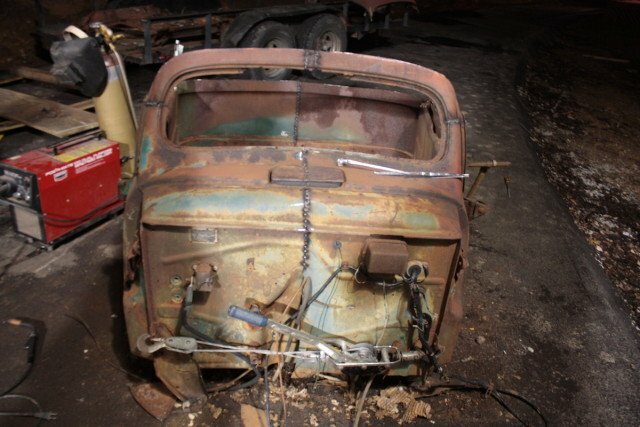 The El Cheapo project will go from scratch to registering the car, and we’ll show you how. 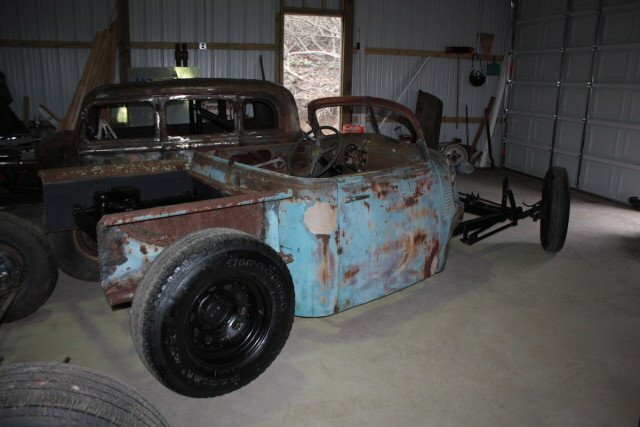 At any rate, for the next 12 – 16 months, we will be building a $1,500 rat rod, suitable for any old geezer wanting to get their feet wet, or at least soaking a big toe. We will start with the most important ingredient, the body, then move to building a frame from scratch, and setting up the rearend and front axle assembly. Next, we will follow with the steering set up, mounting the motor and drivetrain, and then on to interior ideas along with the dash and instruments. Another article will feature wiring and another on all of the accessories. In just over a year, and about 1,500 dollars, this could be you. There will also be an article about where and how to buy cheap. At the end of the ride, we will get into all of the options on making the rod street legal. There is a wealth of material on getting an old rod titled and licensed. We will cover all of this in up and coming articles, so don’t dare miss a single one. Also, check us out online at RingRods HotRod shop, or Tommy Lee Ring on Facebook. Our videos are posted on youtube and Vimeo under Tommy Ring or RingRods.